A prison art competition calling for drawings of biblical images drew over 140 entries. Moana Tipa, Prison Art Advisor, Arts Access Aotearoa, reports. A total of 96 art makers in 18 prisons across the country took part in the Bible Society of New Zealand competition. Six winning works will be included within the pages of a new bible for prisoners due for publication in 2011. The inspiration for the initiative came from Stephen Opie, of Bible Society of NZ , a non-denominational organisation widely respected by churches across New Zealand. The idea was progressed through Prison Chaplaincy Services Aotearoa NZ (PCSNZ), which saw the opportunity to work alongside and produce a bible specifically for prisoners. One of those judges, Stephen Opie, was overwhelmed to see the responses on the walls in front of him. His colleague, Silke Hendel, was surprised at the passion and knowledge of Christ amongst some of the art makers. There were as many perspectives of Christ and Christianity as there were entries. There were equally as many levels of skill in the use of pencil, biro, coloured pencils as there was light, shade and depth. The task of judging appeared somewhat daunting. How important was biblical accuracy? Could the judges agree on the spirit or the attitude of a work? The strength of the core idea and its translation into visual form was what eventually surfaced. Where works were similar in content, design or in their markings, it was likely that art-makers had accessed the only Christian visual images available from prison libraries or been helped by others to make their works. Of the six works chosen, four were outstanding. The winning work, The Fisher of Men, was original in every sense, featuring Jesus with a hand extended, a fishing boat in the sea behind him and Calvary in the distance. One of the judges, Father Peter Healy, an artist and Chaplain of about four years at Wellington Prison, said his basic take on any creative pursuit is that it is a spiritual activity anyway. He felt the face of Christ in the winning work had a real freshness. 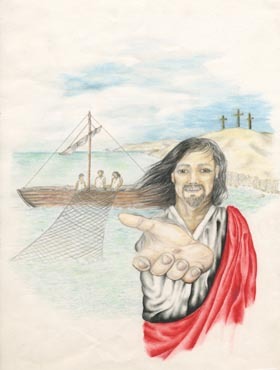 A pencil drawing titled A bold, smiling Jesus, was thought to be a copy or a version of the well known poster ‘the Laughing Jesus’, standing with the rope of the fishing net draped easily over his hands. The Cross of Jesus is another skillfully drawn work in coloured pencils. It has a strong meditative feel about it; an unexpected and insightful quality about the guard kneeling at the foot of the cross, holding the spear that pierced the side of Christ. The Carved Cross of the Pacific presented a mix of responses. The small inset drawing of Jesus appears in part to be a copy of a well-known image, adjusted to the aesthetic of the artist. The easily drawn carving style of the cross could be Maori. Stephen Opie drew attention back to the bold statement made in this work -- the easily overlooked paradox of the cross -- a symbol of the ultimate violence of humanity and the word ‘love’ carved into it. Original generation time 1.3420 seconds. Cache Loaded in: 0.0004 seconds.